I have connected an ESC (an electronic speed control) with a battery and a brushless motor. 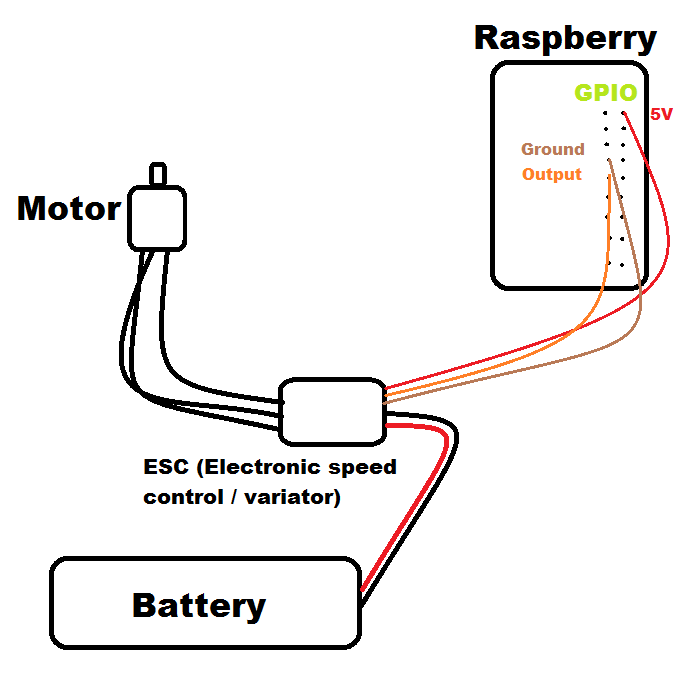 The Raspberry is connected to the ESC to control it. I know - when I turn on the program that is on the Raspberry - the battery and the ESC used to do some beeps, then I could turn the motor. I think I have a stupid problem, now with the same configuration the battery and the ESC doesn't want to beep anymore and I can't use the motor. Nothing happend. I'm suspecting GIPOs Pi to be "broken" and not send the signal but I already check them with a voltmeter and it's seems all GPIOs are OK.
Do you have any idea where the problem comes from ? Here a drawing of the setup. I call Output the pin who send the right energy voltage to control the speed of the motor. "Run the procedure to init the PWM"
"increases W% for the motor"
"Checks W% is between limits than sets it"
You should not power the ESC through both battery and Pi's 5V pin 2, it may cause damage. Your BEC of the ESC may already be totally fried now. It happened to mine before. Your motor battery is already powering the ESC's BEC, so you should never connect the ESC's red wire to anything, because double-powering will cause voltage confusion (amper overload, I don't know what the right term for it). The white and ground cable are fine to be connected as per your diagram, but never connect the red one to any other power source. Not the answer you're looking for? Browse other questions tagged gpio hardware rpi.gpio dc-motor or ask your own question. How to use PI4J with a brushless motor?